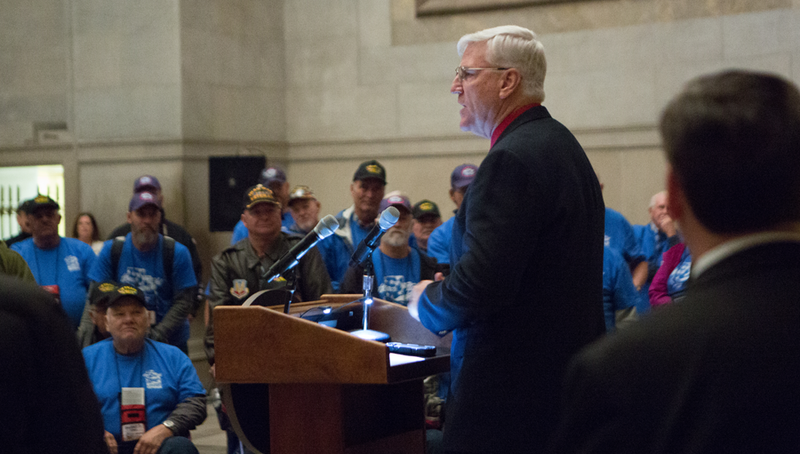 WASHINGTON, November 14, 2017 — Forty-eight Vietnam War veterans came from Utah as part of an Honor Flight to the National Archives in Washington, DC, where they attended the November 10 public opening of the “Remembering Vietnam” exhibit, in conjunction with the observance of the Veterans Day holiday. 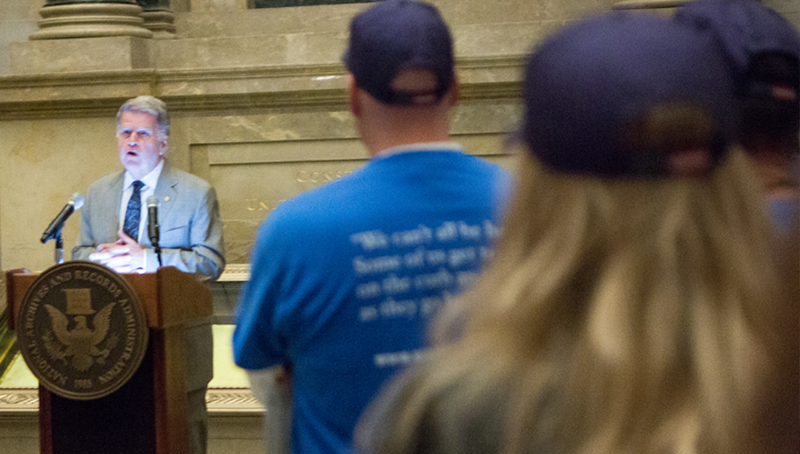 Archivist of the United States and fellow Vietnam War veteran David S. Ferriero welcomed the veterans to the National Archives amidst the Founding Documents—the Declaration of Independence, the Constitution, and the Bill of Rights—in the National Archives Rotunda. 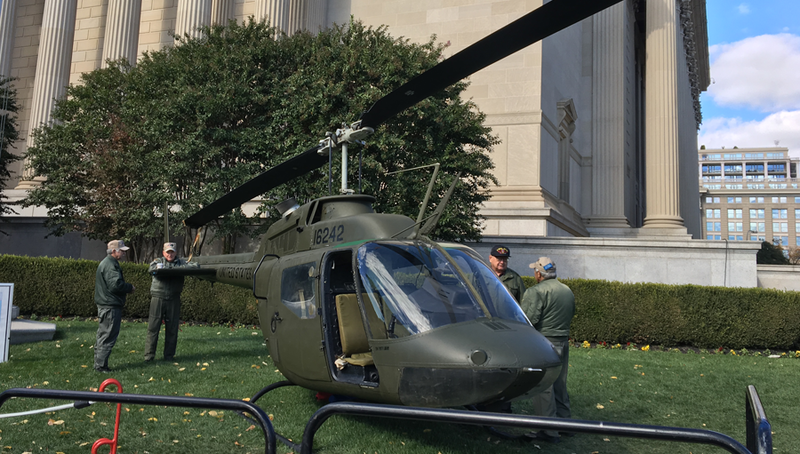 “As a veteran of the Vietnam War, I was determined to mark the 50th anniversary of the height of the Vietnam War with an exhibition here at the National Archives,” Ferriero said. 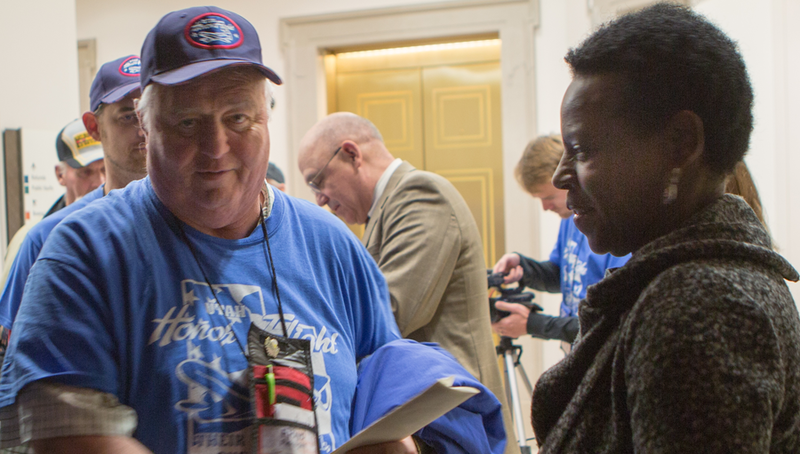 Keynote speaker Earl Morse, co-founder of the Honor Flight Network, shared his experience as the son of a Vietnam soldier and his memories as an elementary student living on a military base during the war. He told how three times during his childhood he watched fellow students being told their fathers would not return alive from battle. He shared how his own father’s silence about the war after his return truly affected their whole family. 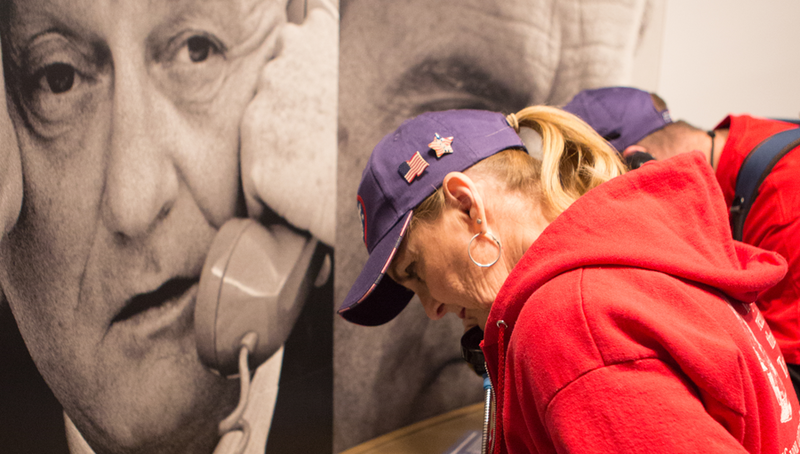 Many of the men who attended were visibly touched; the exhibit seemed to bring out many emotions and memories that were clearly still strong in their minds decades later. 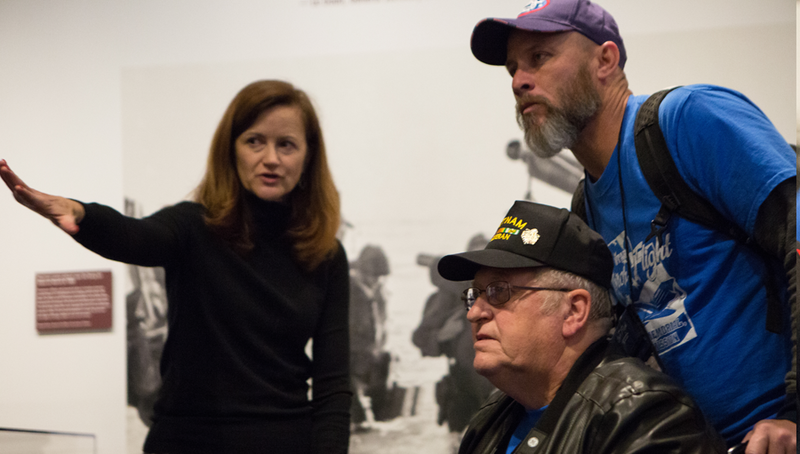 Roger Clegg, David Pratz, and Ralph Esparza viewed an interactive map of the war zone within the exhibit, sharing their own personal stories and memories from the trying times of war. “It brings brings back so many memories and puts tears in your eyes,” Clegg said. “It’s tough. When we came home we were treated horribly.” He told how many military men and women were spat upon when they returned from the war. He told of the disrespect so many showed for those who answered the nation’s call and went to fight. Esparza shared that the exhibit brought back many vivid memories for him. 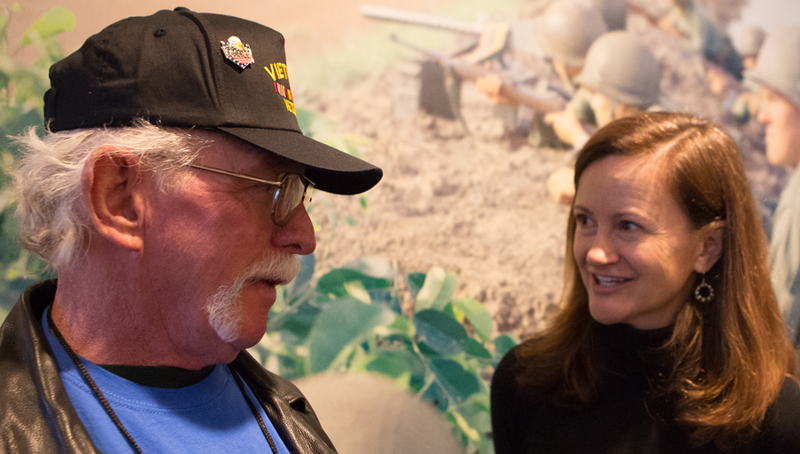 While in our nation's capital, the veterans also visited memorials and other important sites throughout the city. 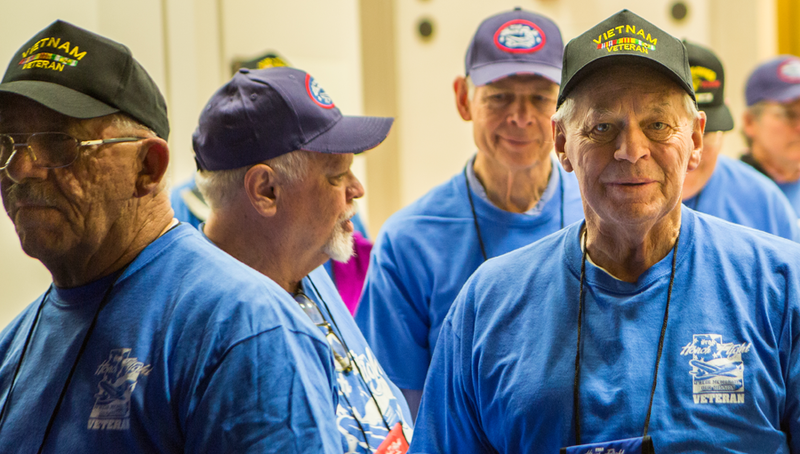 According to Honor Flight officials, this Honor Flight was special for two reasons: First, this flight consisted solely of Vietnam veterans, marking the first time veterans from Vietnam were singled out. 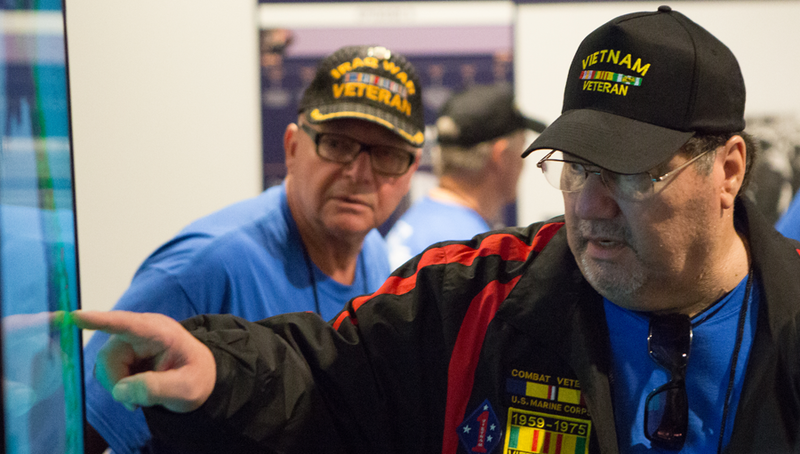 Second, the veterans were invited to be the very first group to publicly view the interactive, media-rich exhibit on the day it was opened to the public. 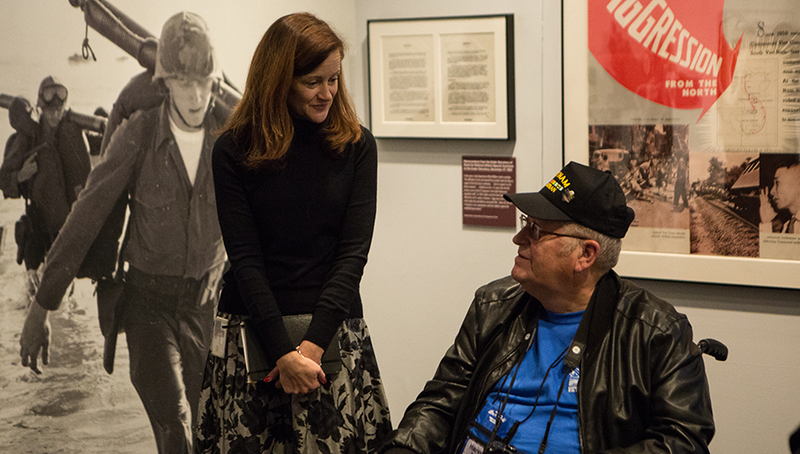 “Remembering Vietnam” will be open until January 9, 2019. 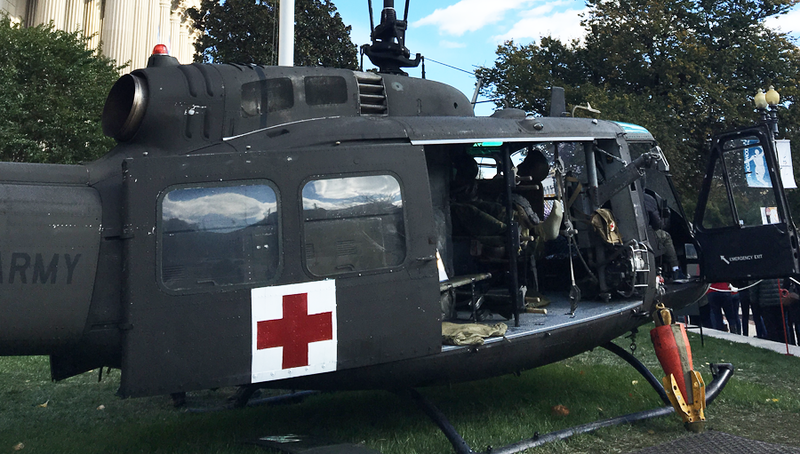 The exhibit explores 12 critical episodes in the Vietnam War and seeks to answer questions about this turbulent period in American history. Read more about the exhibit at Archives.gov, AOTUS blog post, Prologue magazine, and the Unwritten Record blog. 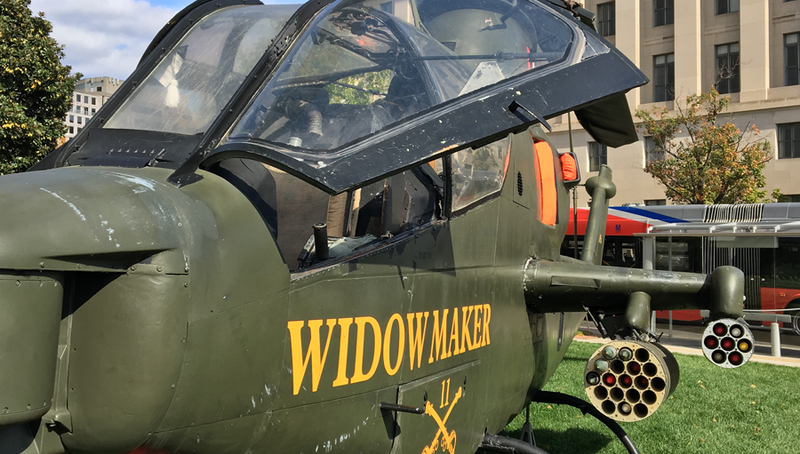 The grand opening of the exhibit also featured three original Vietnam War–era helicopters on display on the National Archives grounds—the Bell AH-1 Cobra, the Bell UH-1 Iroquois, and the Bell OH-58 Kiowa. 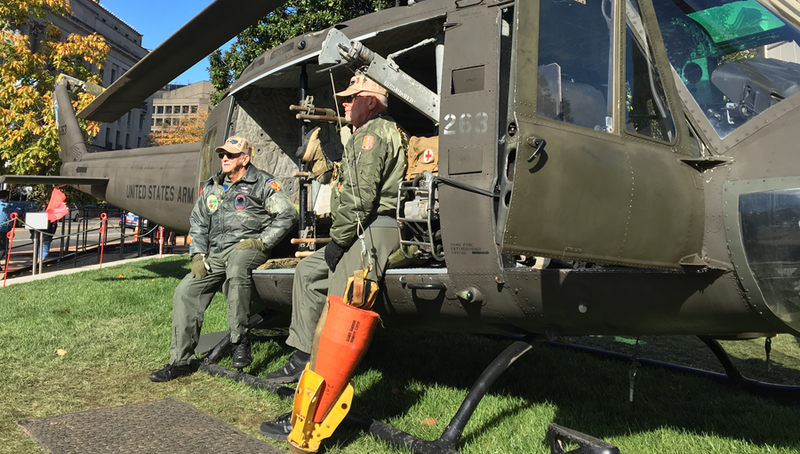 The North Carolina Vietnam Helicopter Pilots Association arrived after dark on November 6 and installed the helicopters, where they remained through opening weekend of the new exhibit until Monday, November 13. 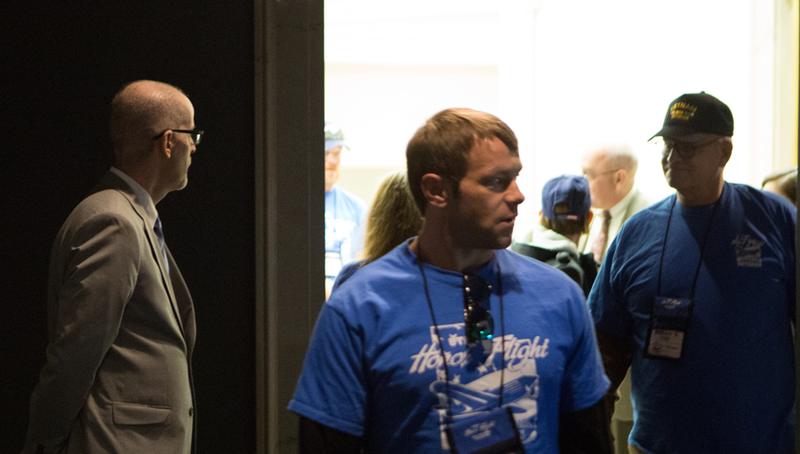 The public was able to tour the aircraft and speak to members of the association, who were all pilots of these types of aircraft during the war. 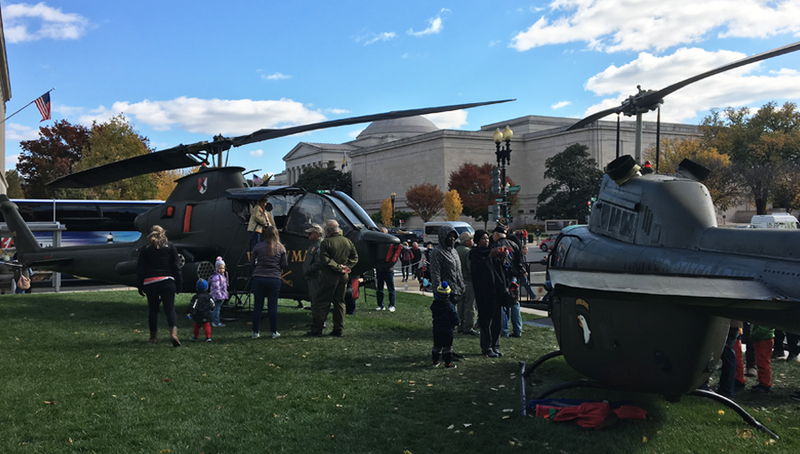 In addition, free public programs—including author lectures, panel discussions, and films centered on the Vietnam War era—have been featured this fall and continue throughout the coming months. For more information on these events, see the online Calendar of Events. To read more about the Vietnam War and see the resources available at the National Archives, visit this dedicated page on the Vietnam War. This page was last reviewed on November 28, 2017.